If you’d like to shed a few pounds, have more energy, improve your fitness level then Nordic walking is an enjoyable way to do this. It is a total body work out, it will keep you fit toned & healthy and anyone can do it – regardless of age, weight, or gender. You will notice the difference after several weeks of Nordic walking – better conditioning, more relaxed muscles and better health. Nordic walking can be considerably more comfortable than either jogging or regular walking; the use of the poles exercises the upper body and also reduces the load on your joints. Nordic walking has its roots in Europe and has been likened to cross-country skiing without the skis, and is the chosen off season training method for competitive cross-country skiers. Development of Nordic walking to its present form as a recreational physical activity for all started back in 1980 in Finland and in 1997 the first official Nordic walking poles were introduced to the public. The technique is an enhanced form of natural walking, suitable for all abilities and ages. It’s an ideal activity for people who haven’t exercised for a while or who dislike traditional sports or gym activities. An injured person can use the poles to support and guide, working to improve fitness as part of their rehabilitation. Athletes can use Nordic walking for cross training and can incorporate Nordic running which exercises the upper and lower parts of the body simultaneously. The beauty of Nordic walking is that it combines the simplicity and accessibility of walking with simultaneous core and upper body conditioning similar to Cross country skiing. The result is a workout that can burn significantly more calories without a change in perceived exertion or having to walk faster, due to the use of many large core and other upper-body muscles. In order to remind our brain to move the arms when we walk, we use trekking poles. These poles will constantly remind us and our brain that we should move our arms. Besides adding to calorie consumption and muscle workout, the trekking poles also provide extra support for our joints and this is very useful for overweight and obese people. 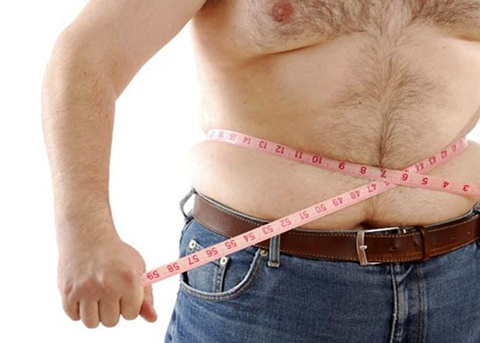 Many obese and overweight people have great difficulties working out an exercising properly, simply because their weight prevents them from during a normal workout. The trekking poles will turn simple walking into a exercise session and at the same time make the walk less stressful for the joints. Most overweight and elderly people have difficulties walking fast enough to get the heart rate up, the walking poles will help you getting the blood pumping and yet keeping a moderate speed. Trekking poles or walking poles are also very easy to bring with you at all time, this way you will use them every time you walk turning everyday chores into a little work out. Some poles even come in a telescopic version which are easy to keep in a bag and such. Most dietitians recommend these poles as a supplement to the daily workout. The poles come with written instructions and a instruction video for correct usage. A qualified instructor will help you with the correct sizing of pole and can give you appropriate advice when it comes to purchasing poles. Improves and maintains your general health and fitness. Up to 50 % more calories burned. Increased strength and endurance in the core muscles and the entire upper body. Removes stress from usual stress points such as knees, hips and back. Easy to bring with you to work, on vacations etc. Burning more calories than in regular walking. An overweight / obesity friendly workout. Helps with weight loss or weight maintenance. Significantly takes the weight off hip, knee and ankle joints. Great cardiovascular workout for overweight and elderly people. You can expend 20-46% more calories than when regulary walking at the same walking speed or even jogging. 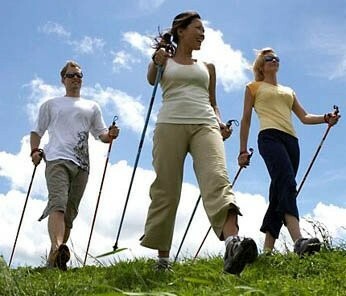 Moreover Nordic walking can actually feel easier and less tiring than regular walking. By using muscles in the upper body, some of the vertical forces put on the lower body are transferred through the poles instead of the legs. 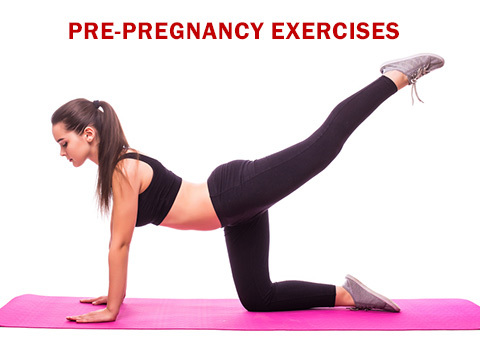 This provides both better balance and more intense exercise. Walking with poles can reduce accumulated force by about 6 tons over the course of a mile. Walking with poles is good exercise for everyone. These different levels are appropriate for trainees different levels of physical ability and their individual aims. The majority of Nordic walkers fall into this level. The low intensity of this type of training means it is accessible to anyone. If you are a regular social walker, simply by adding a set of poles you can increase your heart rate substantially without any great perceivable increase in effort. The reason behind this is the inclusion of the upper body muscle groups during the activity. The resulting health benefits are enormous, as not only are you utilising and toning 90% of the body’s muscles, but you are also increasing your overall effort in such a way that will provide long lasting benefits. Fitness level Nordic walking targets the more intermediate level of fitness and is designed to train students at a slightly higher intensity than the Health level. As well as the benefits experienced within the Health level Fitness level Nordic walkers will also experience improvement in aerobic capacity and endurance. This is the most challenging of the Nordic walking levels and targets those athletes who wish to train within the 80% -95% Max HR zone. It is often called the anaerobic zone and includes aspects such as interval training and is particularly demanding. 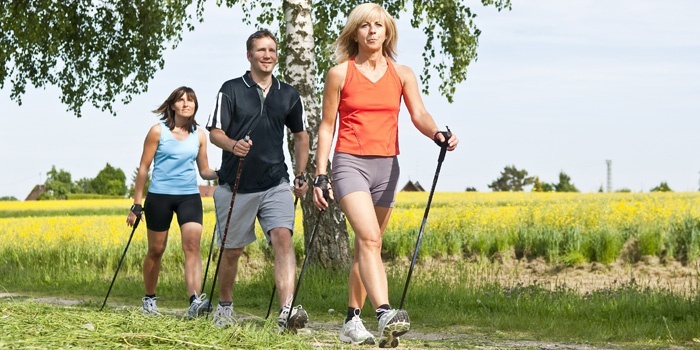 Nordic walking is particularly useful for this kind of training as the technique utilises 90% of the body’s muscles in a supported way, thus no particular muscle group is isolated or strained. Isn’t Nordic walking just for the elderly? No it’s for people of all ages and abilities. Not at all, it is a great way of getting fitter gently and you will see improvement rather fast. How is Nordic walking better than going to the gym or other exercise? The huge difference is to be able to exercise outside, which gives a feeling of exhilaration from being in the fresh air and in pleasant surroundings. It is also very sociable, people want to exercise but still be able to talk and feel relaxed. 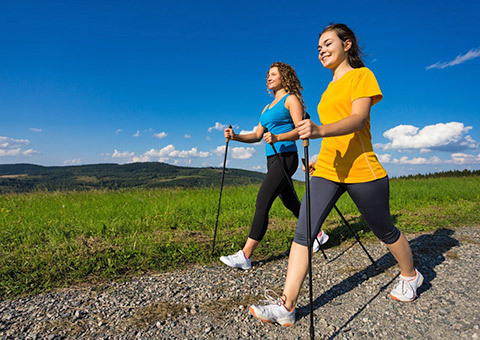 Nordic walking is a great fitness workout for people who are looking for an efficient activity and with maximum health benefits, combined with fun and convenience. It is best to wear trainers rather than walking boots. Light layers of clothing rather that one heavy coat, a waterproof jacket is ideal in wet conditions, stretchy trousers or jogging bottoms and hats & gloves if very cold. I run regularly but I am concerned about damage to my joints, could Nordic walking compliment my running? Yes very much so, it will help you to increase overall strength and endurance without putting strain on your joints (unlike running) due to the way we use the poles to propel us forward. Many doctors agree that Nordic walking is one of the most effective cardiovascular workouts because it works all major muscle groups in the body. Millions of runners and joggers, many of whom suffered from knee, hip or joint problems, find that Nordic walking is great for those who can no longer take the steady pounding of running or jogging on their joints, but want the same health benefits of a full workout. I am 70 years of age and had a knee replacement 4 months ago, could Nordic walking help me regain my mobility and fitness? Yes because the way we use the poles to propel us forward, helping to take the weight off the knees and other joints, while strengthening the muscles and helping to gain better stamina. The great thing about the poles is that you are spreading your load over four feet instead of two feet!